The future of computing is Cloud Computing and there is tremendous competition between big companies like Google and Microsoft. The recent move by Microsoft by introducing Microsoft Office Web Apps is aimed at hurting its Mountain View based rival Google and its free Office service Google Docs. 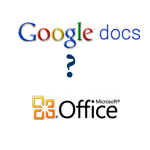 So how do you really compare Google Docs and Microsoft Office Web Apps? One of the best features of Google Docs is sharing. It is so easy to share your presentations and documents using Google Docs. You can also embed a presentation within a webpage. Microsoft Office Web Apps still does not allow embedding a presentation within a webpage. Google allows multiple users to edit the same document or spreadsheet at the same time. Microsoft Office Web Apps still allows limited collaboration. Microsoft Web Apps is a clear winner when it comes to compatibility with its desktop version Microsoft Office suite. Word documents and PowerPoint presentations are still not fully compatibility with Google Docs. The animations and effects of presentation are restored in Microsoft Web Apps and not in Google Docs. However when you create a document online it is created in the latest version (MS Office 2007 and upper versions), so you cannot open it usin the older versions of MS Office 2003. As far as browser compatibility is concerned both don't support the worst browser available Internet Explorer6. Microsoft Office gives you a cool 25 GB of web space compared to Google's 7 GB limit. Also Microsoft Skydrive does not have a 1 GB upload limit like Google. Most of us are still used to Microsoft Office and therefore getting used to Google Docs will take time. Although Google engineers have tried really hard, it still lacks the design and ease of use compared to Microsoft Office Web Apps. The problem is that Google uses the same WYSIWYG (What You See Is What You Get) editor that is used in GMail and Blogger. On the other hand MS Web Apps use the same toolbars and layout. As a result new users will find it really easy to use compared to Google Docs. Both Google Docs and Microsoft office are good to use and the best part is they are free.